Ferrari's Sebastian Vettel (right) after qualifying third for Sunday's Spanish F1 Grand Prix. Mercedes driver Lewis Hamilton took pole position for today’s Formula 1 Spanish Grand Prix, followed closely by teammate Valtteri Bottas. And though the Mercedes men locked out the front row, the biggest surprise (shock?) came when Ferrari sent its drivers out on the Soft tyre for their final runs in qualifying. This opposed to Hamilton and Bottas running on the Super Soft tyre. 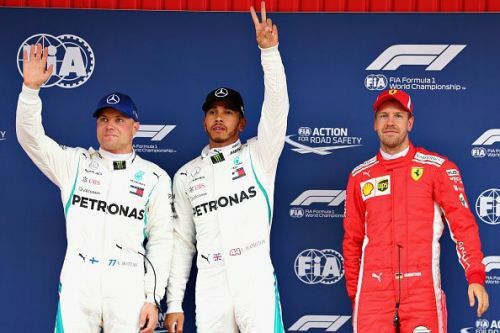 Sebastian Vettel and Kimi Raikkonen took third and fourth positions for the start of the race, but the kicker was Ferrari’s decision to not run the fastest tyre available for both drivers’ final run. Throughout qualifying it was Ferrari and Vettel that proved to be the fastest. In Q1 Vettel led the field and in Q2 he did the same. On the Super Soft tyre, Vettel was the first driver to dip into the 1min17sec-mark with a 1:16.8. It was clear, then, that they were the team and driver to beat. In Q3, however, the contenders for pole position did their first run on the Super Soft tyre and it was Hamilton who gave the first blow; going more than half a second faster than Vettel. After returning to the pits, all drivers had fresh tyres fitted to their cars and it is here that it becomes interesting. Hamilton and Bottas went out on track again on the Super Soft tyre, and Vettel and Raikkonen on the Softs. Logic would tell you that the faster tyre is the better option, but Ferrari, like Red Bull, believed that the Soft tyre would give them better performance. Ultimately Vettel lost out to pole by under 0.2 seconds. Both Ferrari men delivered sloppy first runs en route to pole position, but because of that, they should have been back on track, on the Super Softs, when their final runs commenced. Vettel and Raikkonen did not allow the fastest tyre to deliver the promised performance, and instead reverted back to the slower tyre. They may have lost out by the slightest of margins, but history has shown that fortune favours the top two positions around this circuit. Since the Spanish GP's addition to the F1 calendar in 1991, the race around the Catalunya circuit has only be won twice by a driver not starting on the first row - Alonso in 2013 after qualifying fifth, and one a prior occasion when a driver started in third place. Clearly, then, the statistics favour the driver starting from the top two positions. Ferrari may have an outside chance of getting the win today, especially because their car is the best out of everyone else’s. The speed is there and the driveability is much better than Mercedes’ car. Vettel, or Raikkonen, could just do what Alonso did in 2013 and get that Ferrari over the line first, but due to driver error and (what looks like) poor strategic calls, the race might just be an uphill battle. Getting the race win is not impossible, but no driver wants to start his race with their backs against the wall. Mercedes’ car is fast and both Hamilton and Bottas are blistering quick, but in the race Ferrari might just prove to be quicker. If not, then the tables have clearly turned and could Mercedes be in the pounding seat for season honours.